Treat your mini and her best gal (or guy!) pals to an elegant celebration featuring our perfectly proportioned junior high tea. 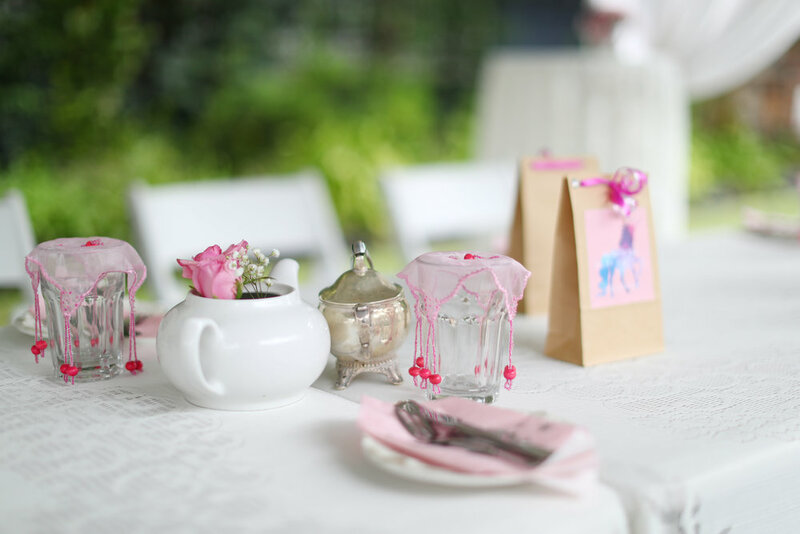 Junior high tea parties are available for children aged 12 and under, with our private covered meadow pavilion set among lush gardens a popular choice for birthday celebrations of up to 20 children. High tea is served on shared platters and our vintage tiered stands filled with delicious housemade savoury treats and sweet delights, as well as Teavine House’s signature mini scones served with fresh cream and seasonal preserves. Tables are set with lovely lace tablecloths, teapots filled with fresh flowers, and tableware styled to match your party theme. Customise your event with add-ons including a celebration cake, face painting, or professional event styling. You are welcome to bring your own cake, as well as BYO wine and champagne for the parents if desired ($2.50 corkage per person). * mini outdoor games kit for guests to use during party. * have another theme in mind? Talk to us about customising your high tea party package. Complement your party theme with beautiful balloon decorations, ranging from simple yet stunning to show-stopping. Helium balloon arrangements available from around $12 delivered and installed to bring added pizzazz to your event. Face painting is always a winning addition to your party! Our hand-picked friendly and professional face painters use only top-quality, hypoallergenic products to create colour magic as they adorn young guests in stunning designs including artistic unicorns and so much more! Package can include glitter tattoos. (last 2-5 days). Your costumed party host engages children throughout the party time with an exciting range of party games, plus prizes! Package includes your desired combination of face painting/glitter tattoos/ balloon twisting. Parents can relax and enjoy the day as their children are being entertained! All party hosts hold current Working with Children certification. Themed party favour bags for your guests. Contents example: bracelet, high-quality figurine or toy, stickers, lollipop, Smarties and some wrapped lollies. Our chef can customise a beautiful semi-naked style celebration cake adorned with fresh flowers to provide a decadent finale to your child's party.